The £2 billion investment is the largest airside project Heathrow has ever undertaken and the environmental team from Balfour Beatty gathered information prior to work being carried out on materials to suit their own Sustainability Action Plan. Following KPIs being measured in areas including energy, water usage and materials, Crown Trade’s flame retardant paint was applied by H&S Decorating Specialists in 5,000 litres across large parts of the terminal. Crown Paints carbon footprint reporting service was used throughout the project, as the company aims to reduce carbon output by 10% for 2015 and 25% by 2020 though its Earthbalance programme. 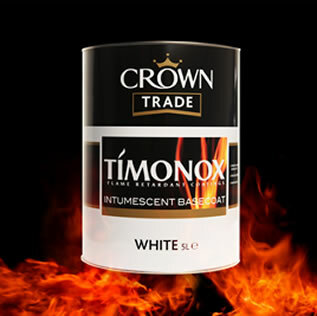 Timonox Flame Retardant Coatings are designed to offer a high level of flame resistance and can maintain the fire rating of the construction with subsequent applications. Timonox can provide additional time for the evacuation of a building when applied to walls, ceilings of corridors, stairwells and communal areas that form part of an escape route, reducing the risk of fire spread where layers of conventional paint can create a flammable surface. The coating is often used for refurbishment projects where its spreads flame more slowly than traditional paint, whether water borne or solvent borne and can be used over multiple layers of sound, standard paints to re-instate the original fire rating of surfaces. Terminal 2B has been constructed by Balfour Beatty as the world’s first Building Research Establishment Environmental Assessment Method BREEAM certified airport terminal.